To reach the Holt Cemetery from Collinwood, Tennessee, travel Tennessee Highway 13 south for approximately 4 miles. Turn right off Hwy. 13 to the Natchez Trace Parkway. Turn left (south) on the Parkway and travel 6 miles to Weatherford Creek Road. Turn right (west) onto Weatherford Creek Rd. and go about ¼ mile and turn right (north) onto Big Cypress Road. Go about .2 mile to the cemetery on the right side of the road. This cemetery is in Wayne County, Tennessee just west of the Natchez Trace Parkway and south of Collinwood, Tennessee. The cemetery is maintained by a local resident. It has a concrete and concrete block wall around three sides with the name “Holt” in both of the concrete corners. Brewer, Amanda C.; b. 03 Nov 1863, d. 10 July 1864, daughter of Hiram and C. F.
Holt, Benjamin; b. 06 Apr 1806, d. 06 Mar 1894, husband of S.G.
Holt, Mollie N.; b. 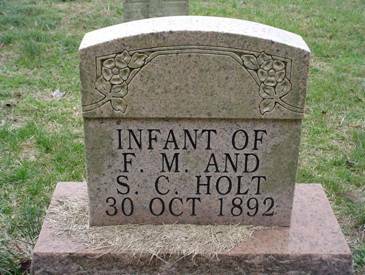 30 Mar 1887, d. 12 May 1890, daughter of William T. and Mary A.
Holt, infant; b. 30 Oct 1892, d. 30 Oct 1892, daughter of F. M. and S. C.
Pigg, Sarah Callie (Cate); b. 22 Dec 1781, d. 07 Mar 1875, wife of John Pigg, m: 1815. Stribling, Hetty C.; b. 14 Feb 1833, d. 28 Mar 1873, wife of J. G.